What to do with all those blue jeans (and other colors) that we no longer wear? I wanted to do something to repurpose these denims, so I started cutting them up into squares! Going to save the pockets for making oven mits, and other fun projects I want to try! I began by constructing these four patches, and that brings me to my first tip: press, press, press! With these thick fabrics, nesting those seams becomes vitally important! And that is easier after you press the seams on the two parts of the four-patch. Now you can see the method to my madness -- the four-patches are beginning to look like a plaid! Here's my second tip: choose your needles correctly, or you will find yourself with broken needles, skipped stitches and more! You can click on this link to see them at the Fat Quarter Shop - and our buddies there have even marked them down! 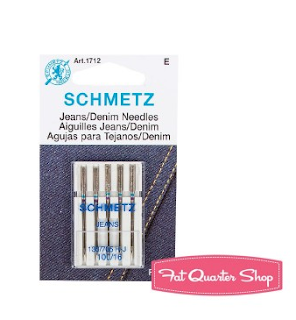 Snap them up fast if there's a denim project in your quilting future! I will check back in soon, to show you more progress. In the meantime, have you made any denim projects? Repurposed some old blue jeans?